People to the land. Music to the hills. 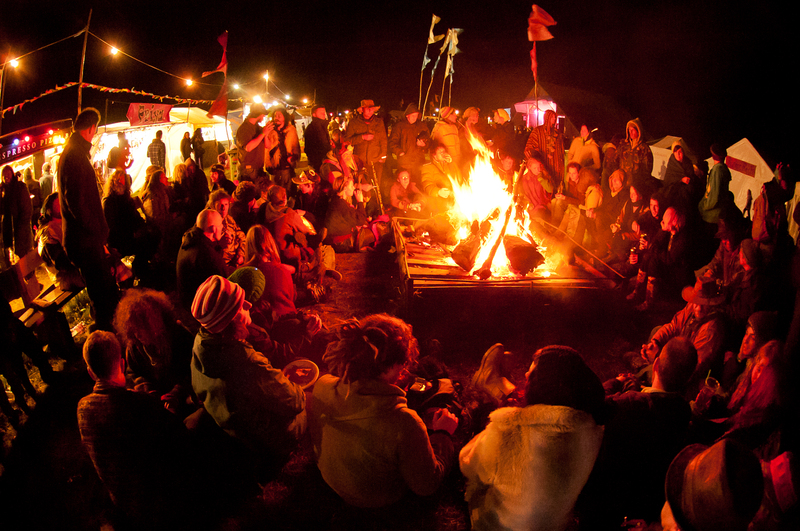 World Ceilidh 2015 is set to be a fireside experience like no other seen before on Knockengorroch Meadows. A warming hearth by day, a twinkling beacon of festival community by night, a glowing tribute to the ancient cattle Bo folk who dwelt here long ago. On waterside of Deugh this May, once again the meadow fires will be re-kindled as so they rightly should. The right for us to light them has been hard won. The relevant Fire, Public Health and Licensing authorities were not easy to convince, but it seems we have succeeded in persuading them that safely managed communal camp fires are an essential feature of this unique Upland Festival. Unsupervised public visitor camp-fires are now prohibited at all music festivals in Scotland, including here at Knockengorroch. For the first time in 18 years we have been instructed by the Scottish Fire & Rescue Service to fully implement the prohibition of ‘unauthorized local fires’at an event whose many loyal patrons have grown to cherish the rare pleasure of their own open outdoor hearth-fire to sit beside. We have no choice in the matter, other than to apologize to those of you who up to now have safely and responsibly managed some of the friendliest and most inspirational festival fires to be found anywhere in Great Britain. Do not be dismayed! In every cloud there is a silver lining. We have an alternative plan, a unique World Geilidh Guest Fire initiative that we believe not only caters to the needs and welfare of our many visitors but that celebrates the wondrous ancient gift of magic fire itself. For every Upland Festival year now passed a tribute welcome fire will burn. To celebrate eighteen great years of music, song and dance on Knockengorroch Meadows, in every arena, and in every local quarter of each and every camp site a warming Ceilidh Guest Fire will be lit, managed and attended by campsite stewards, open to all who camp nearby, or who come to visit, a friendly neighbourhood fireside hearth to set down and enjoy the tranquil Glen of Deugh. On the Loaning field, on Waterside of Deugh, on the wild brae moor, beside streams and pools and even hidden springs, the Black Hairth smoke of old Knokrach o’ Deugh will rise up above the green,and happy folk will meet again. To protect the meadow grass somefires will be portable ‘Black lum’ iron ‘Home-fire’ braziers, while in tribute to Black-stem Garroch ‘Gorroch’ folk whose hearths burned brightly on these meadows long ago, others will be permanent dry-stone clay and turf interpretive features that connect the landscape of the past with the heartbeat of the present day, in a way that only this living World Festival of World Pastoral upland life can do so well. The Fire Service is adamant on the matter. It is a condition of our public entertainment licence that no fires in wheel-hubs are to be allowed, nor can we supply our guests with fire-wood any longer. However, there are those of you we know who come with braziers and a variety of customized metal stoves raised above the ground,who bring your own firewood and who manage your own fires safely and responsibly. It could be that some of you fall into this category, in which case you may be able to still have your camp fire but there must now be conditions: your fire would have to be approved by our Fire Safety officer, and if deemed suitable there would be a 10/15 min briefing on fire safety eg never leaving the fire unattended [or extinguishing it if not being supervised]. Or alternatively you may be happy to camp beside one of our communal fires and help ‘supervise’ it. We cannot guarantee this special privilege, but if you wish to know more, please email info@knockengorroch.org.uk for further info.